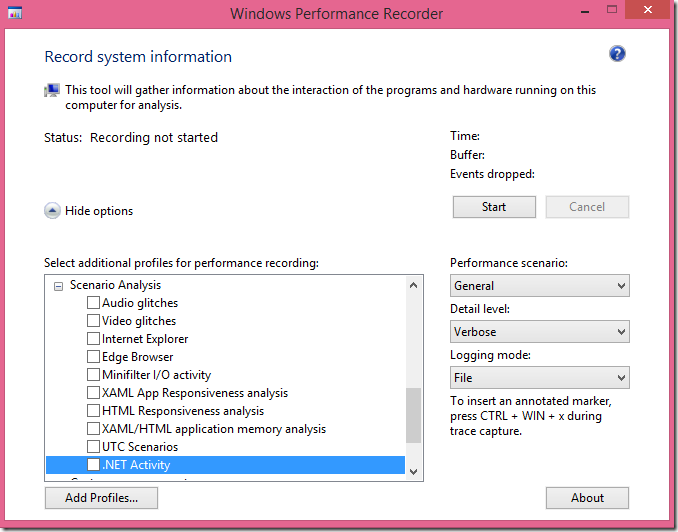 It has been a long wait to finally get the new version of the new Windows Performance Toolkit. I had not much time to test the betas since until now managed call stack resolution was not working. it will install on your machine within minutes. If you download the complete Windows 10 SDK you are not downloading 170MB but several GB. Graphs with short spikes are much better rendered without the need to zoom into to see them. Colors for graphs are changeable (finally). Filtering can be undone now in the context menu. Quick Search in all tables. Symbol load dialog was improved. You can configure your own stack tag files in Trace Properties. No new Graph Types (at least with the default providers I enable). 12 Added columns to CPU Usage Precise. Two are to user mode developers useful: ProcessOutOfMemory and CPU Usage (in view). Occasional crashes are also featured now. The biggest improvement is certainly the possibility to see source file and line numbers. You can find out this way where most CPU is spent on which line if the CPU consumption happens in your code. A quick recap for the newbies: The CPU Usage Sampled graph is generated by taking the stack trace of all running threads 1000 times per second (this is the default). These call stacks are then added together. A count in your Main method of 1000 means that the method has used one second of CPU time. may be causing a high CPU consumption but it might never show up with a source and line number because the stack always ends in an external library call (printf in my case) for which I did not have the pdb loaded. It would be nice to have file and line numbers for managed code as well but this feature is of limited use as it is now. Ideally I want to see this stuff while I am drilling into a call stack all my way down and not only if the call stack ends in a method which I did compile. For Reference here is the complete list of columns you can choose from. Green are unchanged columns, Bold are new ones. I never have found out how to give a thread a name in WPT. If anyone knows more about the mystical thread names and how they can be set I would be very interested in it. This is by far the most complex table. With WPT 10 we have 66 columns to choose from to find out how our threads interact with each other. to check stress tests when the machine was under heavy load which could explain subsequent application failures. get significant Ready times then it differs quite a lot. Otherwise the differences are marginal. There have been quite some renaming of columns which might render your custom filter and enablement conditions useless and WPA will show you an error. This happens to all users of WPT 8.1 which have saved a custom default profile which contains this enablement rule. you will no longer get a view where the Idle process is enabled by default. Green lines are unchanged, yellow are renamed columns and bold are new columns in WPT 10.
complaints about the not complete feature parity between Disc and File view have helped a bit. This view has still a bug. If I zoom into it all graphs are disabled and I have to reenable them after every zoom operation. If I zoom out all is ok. Besides some minor changes the biggest change is that finally it has got a DateTime (local) column. It shows the clock time and not the time since trace start. This can be very useful for advanced scenarios when someone did report an issue and he did care to write down the time when it did happen. I did not know it until it was removed. Process Tree is no longer with us. It was not really useful anyway. you have a parent process which creates many childs. The Disc IO view has got only one additional column with the name Boosted which is for my disc IO always false. Not sure if this is a Windows 10 only feature. If someone knows more about it please comment. very specific workloads and tracing requirements. 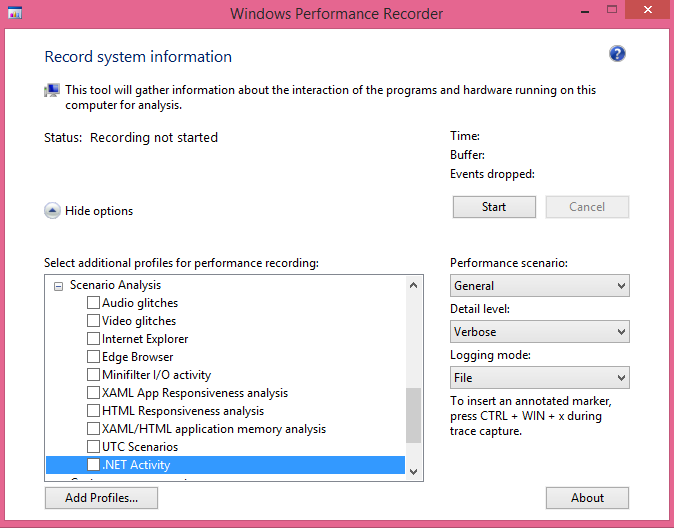 This GUI and the command line tool (wpr.exe) are just too inflexible. if I want to create a configuration for each problem and set them depending on the use case at hand. xperf is still a good tool to stop a profiling session because it does a full CLR rundown. But PerfView is much faster at creating the managed pdbs by not trying to recreate them over and over again with NGen. Tracelog from the Windows SDK is still the only tool to start a trace session where you can configure the Win 8.1 enhancement to the ETW infrastructure. E.g. filter events from a specific process, or disable events or stackwalking for user mode providers. of the etl.NGenPdb folder when present for the generated pdbs of an etl file. This is a useful convention and the old WPA was so nice to automatically include it to my symbol path. much traction. It is like Windbg in disguise which will quickly cause information overload to the untrained brain. But with some basic tricks which I will show in the near future you can crack otherwise unsolvable performance nuts with a few mouse clicks. do you also have the issue that the WPR doesn't add the data to be able load symbols under Windows 7? There are several reason to it. The most important one on Win7 is that for managed JITed x64 code stackwalks do not work. This is fixed in Win 8 and later. As workaround you can NGen the code which will make the stacks walkable again. The second reason I know of is that if the machine has .NET 4.0 installed then you need to set an additional environment variable to make ngen createpdb work at all. The first PerfView versions did use this trick as well. But current versions do not use it as far as I know since it has other negative side effects (please check). See http://bcl.codeplex.com/SourceControl/latest#Tools/ETW/traceEvent/TraceLog.cs for more infos. Search for createpdb. no, this has nothing to do with ngen. WPA loads symbols based on ImageID/DbgID_RSDS events that are adding during merge. It includes the data to laod symbols (Example: GuidSig="662914b4-2b8f-4ec0-b168-59be049eb69e" Age="1" PDBFileName="ntdll.pdb"). Those events are missing when I capture a trace on Win7 with the Win10 WPT. This is the same if you forget to stop traces with xperf -d . this -d also adds those required events. Interesting. I will try this as well on a Win7 machine. Managed code has not got much love with WPT10. There seem to be more symbol load issues where the wrong pdbs are searched. I did call ngen by hand which seems to have triggered the native image generation twice in the same minute for the same dll. That leads to mismatched pdb errors which are kind of awkward because it seems to be more or less random which native image is loaded because both seem to be valid. Microsoft released an Update to the Win10 SDK to match with the November Update 1511 (https://dev.windows.com/en-us/downloads/windows-10-sdk). This 10586 WPT now works fine for Windows 7. Thanks for the hint! The managed pdb generation has also become much faster. It seems it uses the same approach like PerfView which does not need to start an extra ngen create pdb process anymore. Much better!